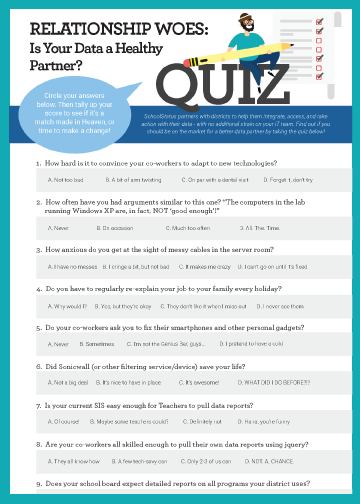 Quiz - Is Your Data a Healthy Partner? If your data isn't helpful and easy to access, it might be time to re-assess the relationship. What's this quiz all about? If the thought of your data and technology solutions is making you anxious, this quiz is for you. Find out if you should be on the market for a better data partner by taking the quiz! Taking the time to assess data health will save you from future headache. If your data isn't measurable and dependable, is it worth collecting? Don't lose sleep over bad data security and integration health. Student insights drive meaningful conversations and meaningful conversations improve student outcomes. SchoolStatus harnesses key insights and delivers actionable information right to your fingertips. We focus on the data, so educators can focus on education. We’re SchoolStatus, and we believe in data for doing.